The old Greenville County Courthouse is located in downtown Greenville. The only example of Beaux Arts architecture in Greenville County, it was built in 1918 and is the fourth courthouse to serve Greenville County. In 1950 the current Greenville County Courthouse was built on its present location on East North Street. The old courthouse continued to house Family Court until 1991. 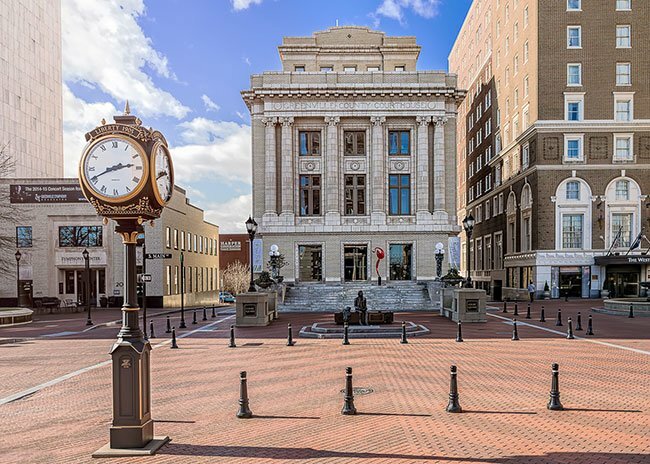 In 1947, this courthouse was the site of the Willie Earle trial, which proved to be an important turning point in race relations in South Carolina. Earle, who was young and black, was arrested for killing a white taxi driver. While awaiting trial, 31 white men kidnapped him from his jail cell and murdered him. Signaling a new intolerance for such actions, the entire lynch mob was arrested and tried for murder and conspiracy. When all the defendants were acquitted, an embarrassingly negative reaction erupted from the international press. It is thought to be the last incident of its kind in South Carolina. Today a bookstore occupies the former courthouse as well as offices. 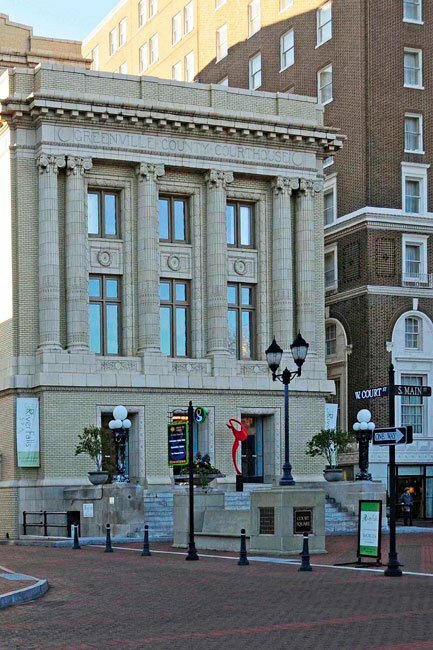 It is a landmark in downtown Greenville, as is its next-door-neighbor, the Poinsett Hotel. (Greenville Family Courts Building) The Greenville County Courthouse, the fourth building employed in this capacity, is significant as an example of early twentieth century public architecture on a monumental scale in the piedmont South, for the high quality of its design and construction, and for its association with a prominent architect, and is also important to the history of Greenville and Greenville County as the seat of law and local government. The primary architect was Georgia architect Phillip Thornton Marye. The supervising architect for the building was H. Olin Jones; J.A. Jones of Charlotte was the contractor. The courthouse is the only existing public Beaux Arts style building in Greenville County. The building is divided into two sections. The eastern section faces Main Street and is three stories in height; each story is 3900 feet in area. Behind it lies an eight-story tower; each story is 2600 square feet in area. A concrete structure with exterior walls of cream colored brick, the building is ornamented with terra cotta trim and details which are representative of the era and the Beaux Arts style. The building served as the courthouse for Greenville County until 1950 when the court was moved to a new building. The Family Court of Greenville County was located then in the building and remained there until 1991. Hi, Lauren. Here is a link to the city website: http://www.greenvillesc.gov/ We hope this helps, and good luck! Is there any way I could get the floor plans of this building? I am doing a project for my architecture history class at Clemson and I picked the Old Greenville County Courthouse to draw in Autocad. I can do the elevation, but I need floor plans as well.